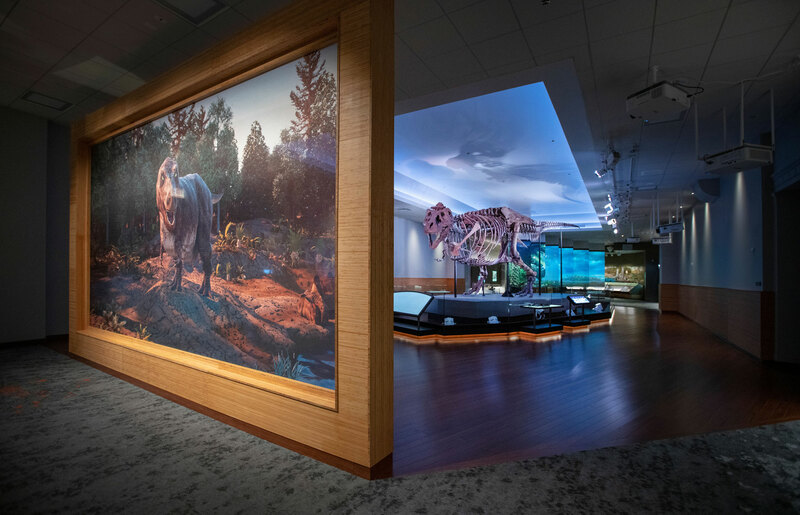 Sue the T. Rex—for years one of the most prominent displays at Chicago's Field Museum—has moved to a new upstairs home, complete with video and audio to tell visitors more about the dinosaur's life. For two decades, the skeleton of Sue, the world's largest Tyrannosaurus Rex, reigned over the Chicago Field Museum’s main-floor Stanley Field Hall. But Sue has now found a new territory on the second level, as part of the Griffin Halls of the Evolving Planet. Sue was always destined to end up in Evolving Planet, according to Angelica Lasala, the museum's public relations coordinator. Sue started being moved, bone by bone, in Febuary 2018, and is now reassembled and ready for the spotlight. Part of the reason for the move was to provide visitors more information about Sue's life. 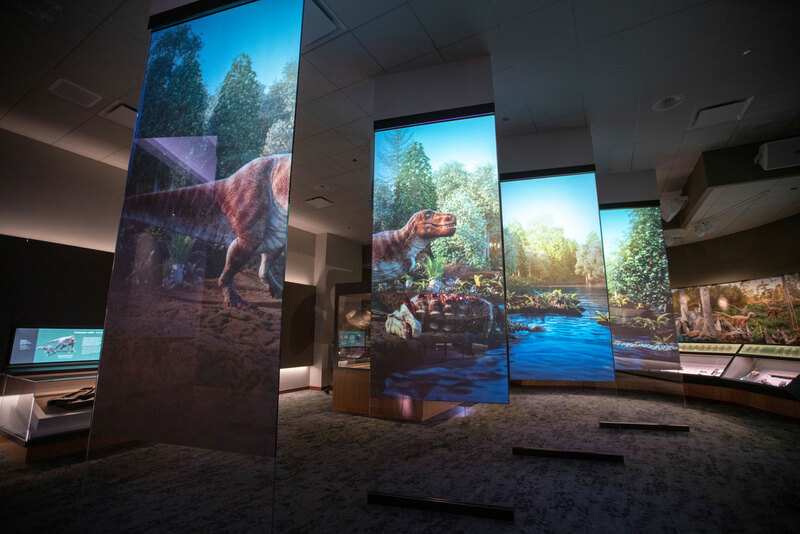 Sue’s new exhibit features a high-tech digital video projection across several panels showing the dinosaur hunting, eating and exploring the environment. An audio recording and light show, pointing out different aspects of the skeleton, also accompanies the exhibit. Another reason for the move was to incorporate new understanding of T Rex. anatomy. Multiple bones were added under the ribs, a support structure that scientists believe helped Sue breathe. Sue's arms were also moved lower on the body, and a wishbone added. Sue was found in Faith, South Dakota, in 1990 by Sue Hendrickson, the dinosaur’s namesake. After the Field Museum purchased the skeleton for $8.4 million, the most money ever paid for a fossil at an auction, it made its official debut in 2000 in the white-marbled, columned Stanley Field Hall. “It brings back those memories of folks vising the Field with their families," Lasala said. "And also, it inspires curiosity in a lot of young scientists. That’s why we wanted to highlight the science behind Sue so heavily in this exhibition space. We want to inspire those journeys of curiosity in everyone who visits." Sue now also has a roaringly-punny Twitter account (@SUEtheTrex) complete with the title “National Treasure” in the bio. Scientists don't know Sue's gender. Sue is the largest physical Tyrannosaurus Rex speciman that's been discovered. So far, only around 30 have been uncovered. She's also the most complete speciman, with 90 percent of the skeleton completed. Around 250 of 380 known bones have been found. Since Sue's skull is too large for its skeleton body, it's displayed separately. The skull displayed with the rest of her skeleton is a smaller cast; the original skull weighs 600 pounds. The holes at the bottom of Sue's jaw on the original skull are believed to have been caused by a disease, and are not bite marks like scientists originally thought. Sue lived around 67 million years ago, in the Cretaceous period, and was alive for about 28 years, the higher end of a T-Rex's life expectancy. Dinosaur bones are similar to trees because they both have rings that can tell scientists how long dinosaurs lived and how quickly they grew. The Field Museum boasts one of the most extensive dinosaur collections in the world. In Sue's former space, visitors can see a new dino friend, Maximo, who is 122 feet long from head to tail. Maximo the Titanosaur is a touchable cast, meaning you can feel his feet (and whatever else you can reach) as much as you want. For the next three months, the Field Museum will also have a dig site pop-up located at 333 N. Michigan Ave. The dig site features replicas of real dinosaur bones and the tools that Field Museum scientists use in their fieldwork. It will be open until June 30, from 11 am to 7 pm Monday through Saturday, and 11 am to 6 pm on Sundays.